The First Class is Free! Come sing, dance, tell stories, and play with us! Starting October 15th! Mondays 4:30 - 5PM for ages 4-6 and Fridays 10:30 -11AM for ages 2-3 (parents are welcome to participate with their child during this class). 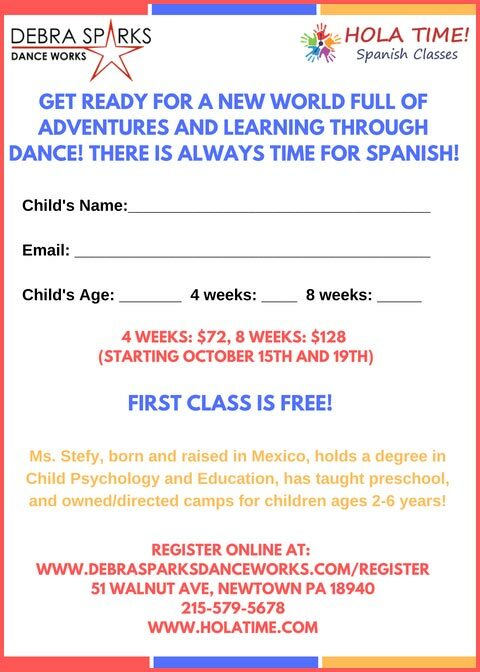 Each class will offer a great variety of activities in which children will learn the language quicker and naturally through movement, repetition, and dance. In congruence with the DSDW philosophy, Ms. Stefy will provide a nurturing atmosphere that promotes participation and builds self-confidence, all while keeping your children entertained and having fun! Ms. Stefy, born and raised in Mexico, holds a degree in Child Psychology and Education, has taught preschool, developed large preschool Spanish programs, and has owned/directed camps for children ages 2-6 years! She is very enthusiastic, always moving, and full of energy that the children love! Parents will receive a weekly report card outlining their child's activities and progress, as well as a comprehensive workbook at the end of the program to take home and continue practicing/learning!